America has a complicated history with airplanes. They started as a luxurious means of travel and represented the core of mankind's exploration of the world. They represented the best of what we were capable of if we put our efforts toward a common goal. Later, they became the weapon of choice as terrorists executed the largest attack in the history of the country. Suddenly, planes became the ammunition in our darkest nightmares. In his latest film Sully, director Clint Eastwood portrays an event of American heroism that explores the complexities of an unplanned aircraft landing in a post 9/11 world. Tom Hanks plays captain Chelsey "Sully" Sullenberger the pilot who managed a miraculous landing of US Airways flight 1549 into the Hudson River. With all of the passengers and crew surviving the unlikely ordeal, Sully is quickly labeled a hero. But as the NTSB begins their standard investigation of the crash, evidence from the wreckage brings Sully's actions into question. He trusts his gut, but models appear to show the event could have been avoided. With his entire career set to be judged on a few fateful minutes of extraordinary circumstance, Sully struggles to defend his legacy while acclimating to his new role as an American hero. Following his hit American Sniper, director Clint Eastwood once agains chronicles the story of a real life hero. Like his previous film, the events of 9/11 cast a shadow over the entire proceedings. Images of the doomed plane gliding through the New York skyline eerily recall the famous news footage from that September morning. But like Sniper, Sully is more about average Americans rising to the occasion than any darkness that terrorism elicits. Despite knowing the end result, the faithful recreation of the water landing left me on edge of my seat. The efforts of the ferry drivers and emergency response teams in the direct aftermath of the incident are reverently portrayed as a tribute to the services of these ordinary heroes. While Aaron Eckhart as co-pilot Jeff Skiles and Laura Linney as Lorraine Sullenberger dutifully fill their supporting roles, there is no denying that this movie belongs to Tom Hanks. As he's done time and time again, Hanks disappears into the role of an everyman in an extraordinary circumstance with ease. He captures the emotional complexity of Sully with a subtlety that makes you forget that you're watching a movie. 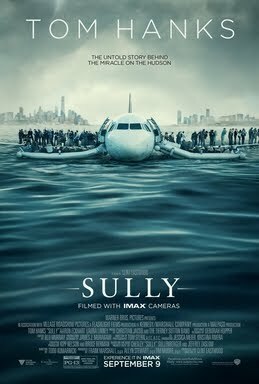 Based on Highest Duty, the autobiography of the real life Sullenberger, Sully is a film that respectfully tells many sides of the story while never losing the focus on its main character. The film checks all the boxes of a potential awards season contender and serves as another solid notch in Eastwood's storied career. This entry was posted on Friday, September 30, 2016 and is filed under Clint Eastwood,Film Adaptation,Friday Flicks,Movie Review,Sully,Tom Hanks. You can follow any responses to this entry through the RSS 2.0. You can leave a response.